Call us today for a free metal roof repair quote! Are you looking for shingle roof contractors to repair some broken and missing shingles on your roof? Are you looking for metal roof repair to ensure your home's interior stay dry? When you're looking through all of the metal roofing companies in the Gainesville, FL area, it can be hard to choose the best one. Your search ends with Godwin Enterprises! Godwin Enterprises is a full service roofing company providing service to home and business owners throughout the Gainesville, FL area. Dedicated to being Florida's eco-friendly roofing company, we can provide you with all the services you need to ensure there is a safe and secure roof over your head. We specialize in designing and installing energy efficient roofing systems that are good for your home and your wallet! Our roofing systems pay for themselves with longevity, strength, tax credits, and energy savings. Godwin is a GATOR family owned and operated company that has been serving Gainesville, FL and all of North Central Florida for over 35 years. 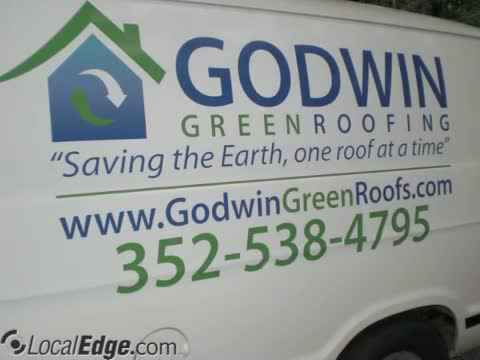 Godwin and his roofing contractor team are saving the earth one roof at a time. We take pride in providing the Gaineville, FL area with roofing services that are affordable. We offer shingle and metal roof repair options that are eligable to receive up to a $1,500 tax credit. Our Metal Roofing Contractor Can Assist With All Of Your Metal Roof Repair, Installation, & More! Metal roofing is becoming a popular roofing style. It is energy efficient in that it blocks the heat from heating up a home and keeps the heat in during the cold winter months. Metal roofing is available in a variety of colors and styles to match your individual style. Our metal roofing contractors are there for you every step on the way, from the initial consultation to installation, to metal roof repair and replacement. Metal roofing is very durable and will last a lifetime if it is properly maintained. When it comes to longevity, there is no better option than a metal roof. Metal roofing is specially treated to withstand the elements and in most cases they significantly outlast traditional shingle roofs. Our team of metal roofing contractors can provide a consultation to provide you with the knowledge you need to make the right choice for your roof. Looking For Standard Shingle Roof Contractors? We've got you covered! Even though we boast about how great metal roofs are, we still provide installation and repair services for the classic shingle roof. We have years of knowledge and experience working with shingle roofs so you can rest assured knowing that we have your job handled, before we even begin! Our shingle roof contractors are there when you need us, whenever you need us. When it comes to roofing services, we are the best. Whether you need roof installation, replacement, or repair services, you can rely on Godwin Green Roofing to help you. We serve clients in Gainesville, FL and the surrounding areas. Our shingle roof contractors can work with various roof materials. We can ensure that your roof is installed properly so that it won't give you problems in the future. Contact our shingle roof contractors for more details. Our Roofing Contractors Take Energy Efficiency Into Account! Godwin Green Roofing has always used Word of Mouth advertising alone! Today we are one of the highest respected and most trusted metal roofing companies around. We take pride in being able to say that we can design and install the most the most energy efficient roofing systems on the market. We go above an beyond other companies in the area because we can give your home a complete energy audit, and design a complete solution to reduce your home's energy consumption. We take the time to survey your roof and your home in order to help make your home as efficient as possible! To really see energy savings, our roofing contractors offer packages that include weatherization, insulation, radiant barriers, solar powered attic ventilation, and skylights. Combining all of these products maximizes your home’s performance and helps your home reach its energy goals. Our roofing contractors provide comprehensive services to patrons throughout the Gainesville, FL area. We take total pride in making your home safe and fully energy efficient. Godwin Enterprises is available 24 hours a day to take care of any emergency that could occur due to weather problems. We know the importance of a quality roof, if the job is not done properly, you could have leaks causing more damage, costing you more money. For a roof job done properly the first time, rely on our shingle and meta roofing contractors today! Whether you need shingle or metal roof repair, we have you covered! We provide free estimates on each and every one of our services! Since your roof is one of the biggest and most important aspects of your home, any work on it can add up. That is why we prepare you ahead of time with a list of the services we will provide and what each element will cost. Our roof repair contractors will complete the work that is needed and won't con you into getting extra work done that is not necessary. If you would like more information about Godwin Enterprises please visit our website. You can also contact our roof repair contractors directly by phone at 352-538-4795 or by email to schedule a consultation! Choose us to assist with all of your roofing and energy saving needs!